This site is dedicated to the memory of my daughter Annie Borjesson who was found dead in Prestwick, Scotland Dec.4 2005. Please read more about the suspicios circumstances sourronding her death and feel free to help with advices of how to proceed in the fight for justice for Annie. On December 4, 2005, Annie Börjesson was found dead on the shore close to the airport in Prestwick, Scotland. In her luggage she had her Swedish passport and two library books that she intended to return to a library in Sweden. Annie also had an appointment with her hairdresser in Sweden on December 5. All evidence points to her travelling home to Sweden. The last observations of Annie were made on December 3 at Prestwick Airport, then walking in the town and later when speaking to two men on the shore. Annie was a very beautiful 30 year old woman. She was healthy and wellbuilt and also a very good swimmer, she never used any drugs and was very careful with alcohol. As a person she was very happy, lively and friendly. Annie was also a very good singer and liked to perform in front of an audience. She spoke English, French, Finish and Hungarian very well. 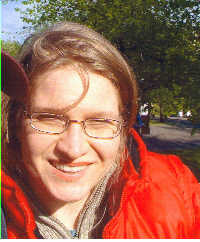 During the autumn of 2004 Annie studied English in Cambridge, came back to Sweden and travelled to Edinburgh in February 2005 to work. Annie went to Scotland of her own free will and she loved Scotland and its people very much. After enquiry Strathclyde Police told her family that Annie had committed a suicide and that there were no suspicious circumstances surrounding her death. Her mother Guje and others travelled to Scotland and after making enquiries found that the information supplied by the police did not match that recovered during their own investigation that pointed to a possible criminal act. The more they looked the more questions were not being answered. Annie had no financial problems. The days before she died she had a successful job interview , had a vaccination, paid the rent for a whole month in advance, bought a leisure card went swimming and attended a rugby game between Scotland & New Zealand. At this time however her family did become concerned that Annie was under some form of threat but she told her mother that it was something she would have to deal with herself. Two weeks after Annie's death her body was returned to Sweden. Surprisingly 60 to 80 centimetres of Annie's hair was missing and the family claim that other forms of desecration of her body have not been satisfactorily explained. They are also concerned at inconsistencies in the post mortem results. Items of Annie's property including a filofax have never been recovered and it is claimed important witnesses have not been interviewed. * Full and comprehensive information on all the circumstances surrounding Annie's death require to be given to her family. * All the information gathered by the family requires to be assessed and investigated preferably by independent police officers. * Consideration requires to be given to making a complaint against the police as a means of having the enquiry reopened.